Garden Adventures - for thumbs of all colors: Gershwin can't have been a gardener. Gershwin can't have been a gardener. It takes imagination I know, but this WILL be gorgeous! Some people host a summer BBQ, inviting neighbors and friends over for a cold drink, chatting together as time slips slowly by. Somehow we find ourselves hosting a BBQ, sharing drinks AND wrestling an excavator through a veritable seabed of blue clay - all at the same time. 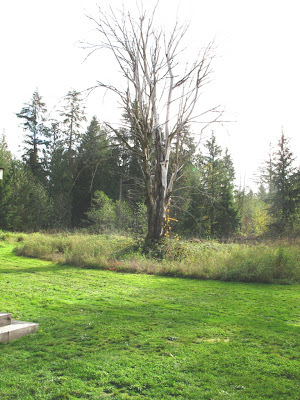 It all started when I casually mentioned the fact that the blackberry infested, reed canary grass thicket with the stunning focal point of a very large dead maple tree would be the perfect place for my ‘drop-dead-gorgeous-must-have-been-designed-by–Karen’ border. Little did we know. Apart from slugs, salamanders and snakes this prime real estate was also inhabited by discarded creosote soaked railroad ties, beer cans, plastic bags, lumps of concrete and enough clay to keep the Staffordshire Potteries in business for another decade. If you have been following my blog from the beginning you may recall the post 'Don't tell me about bog gardens' where we began to address the drainage problems (aka inland lakes). We have been busy since then. 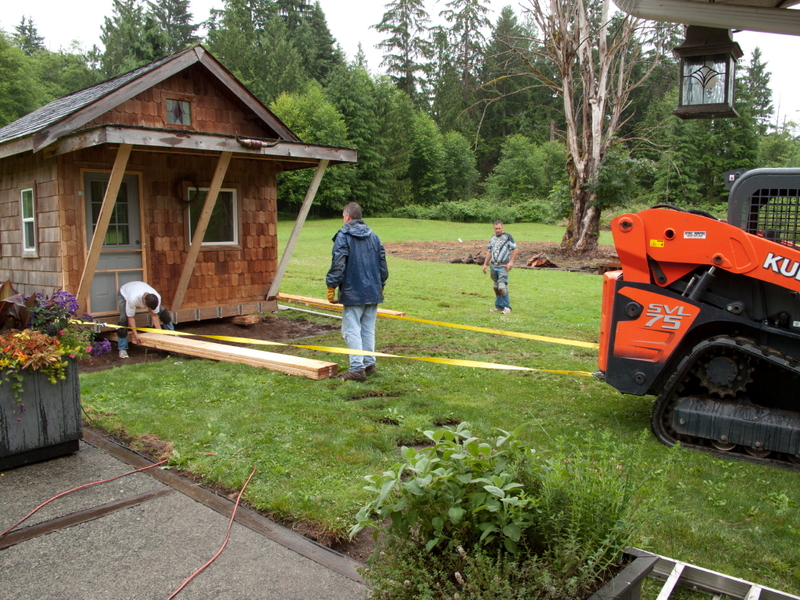 A pretty cedar cabin was already on the property but in less than an ideal location, so using a Skid Steer (a tractor with a big bucket on the front), metal pipes, hunks of wood and lots of muscle the cabin was moved into this new border a week or so ago. Of course it poured with rain the whole time so the grass looks as though we have hosted the NASCAR races. 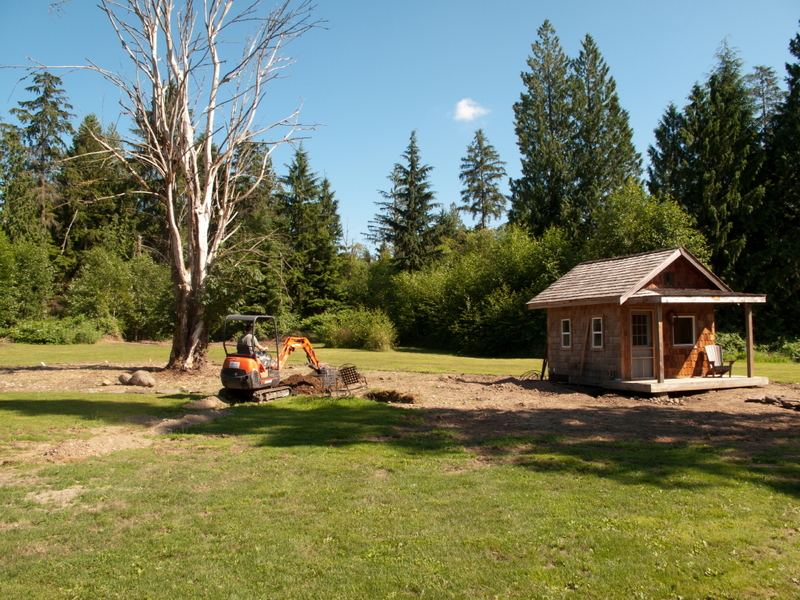 However, the cabin looks perfect in its new location, or at least it will do when I’ve added trees and shrubs to nestle it in. Right now you need imagination. The next big toy to play with was the excavator – a mean machine with an insatiable appetite for soil and rocks. My husband has been digging additional drainage trenches this weekend and mercifully didn’t hit our well water and power lines. We did have an ‘expert’ map out where these were supposed to be – he was wrong. Maneuvering one of these monsters is like patting your head and rubbing your tummy at the same time; with your feet. It takes far more coordination than I can muster but Andy seemed happy enough with his life sized Tonka toy, although it had about as much suspension as a buckin' Bronco. Now our back garden looks like a war zone with mountains of soil heaped up in rows as though the moles have been partying for a week. Actually they have but that is in another part of the garden. So here we are at the end of a nice sunny Seattle weekend, friends and neighbors stopping by for a BBQ, drinks being poured and a leisurely stroll together around the garden to see what’s new. It’s just that in the Chapman household that also means navigating trenches, 8 tons of gravel and 110' of drainage pipe. And instead of the men admiring the latest car or motor bike they discuss the merits of various tractors and related toys. Oh and next weekend? 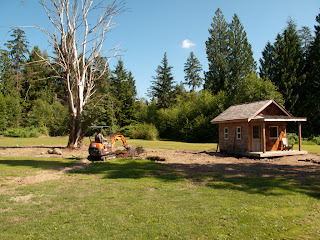 We’ll probably be moving 100 yards of soil around with a Bobcat. And having a BBQ. "Summertime ~ and the livin’ is easy……."